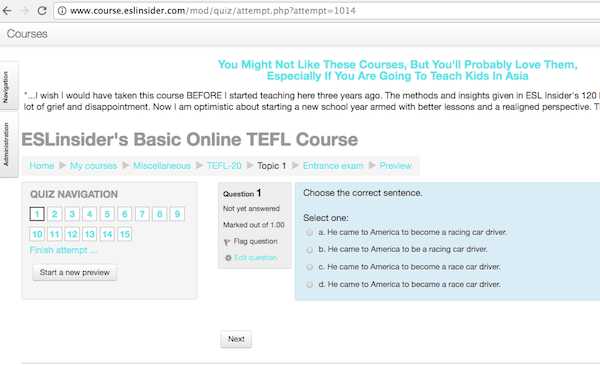 Are you looking for a sample online TEFL course? Or maybe a refresher course? Perhaps a "taster" course? Or maybe you are looking for just a short course. Either way I think you'll find something in this basic course. What sort of things will you learn about? Here is a look at the syllabus. Learning styles and are they accurate? Currently the topics classroom management and beyond are not available in the free option. What does some of the content look like? The course includes reading text, watching videos, answering questions, true and false, assignments and exams. Here is a look an entrance exam question in the basic course. 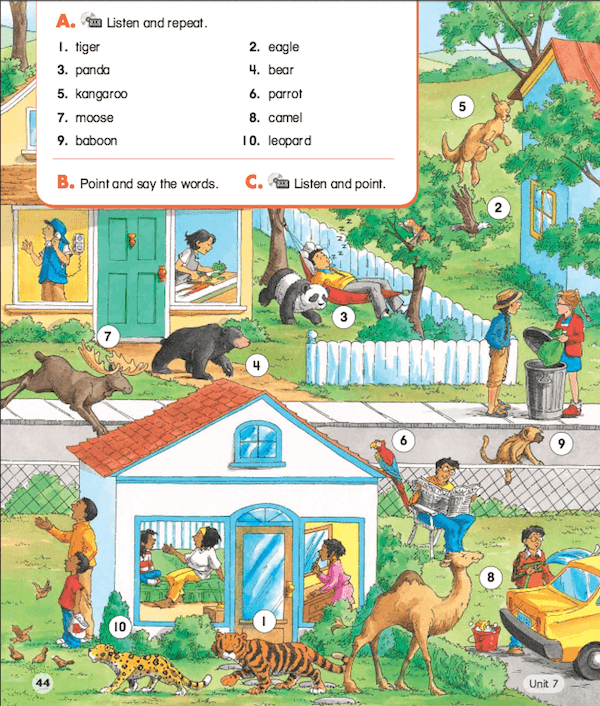 The entrance exam is to see if your English level is up to par to teach abroad. There are currently 15 grammar related questions where you have to choose the correct response. In the advanced course there is also an entrance exam which is slightly more extensive, but also more fun. I called it an "Engrish" exam and used some funny pictures like this. Many courses online will have you read pages of text and then answer questions. But that is not very efficient as far as learning goes since most people just skim and scan. When there is less to read you will read more AND more importantly remember more. Throughout the course content and questions are interlinked together. You can't get to the next topic without answering the questions correctly. You'll need to maintain an 80% or higher to proceed. Studies and research on online TEFL shows that video is a much more engaging than text. ESLinsider's courses include a lot of videos. 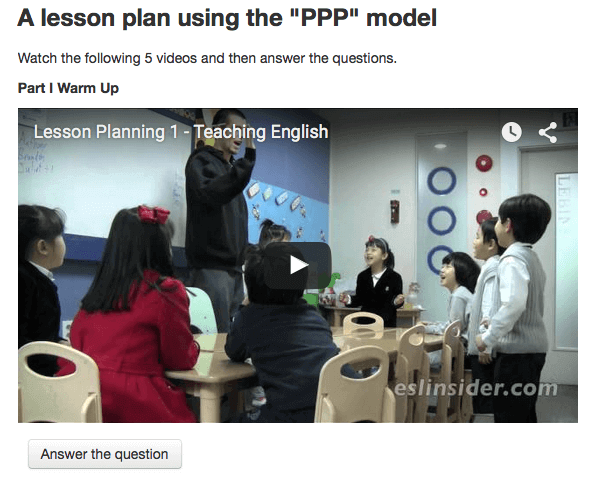 Many of these videos were shot in the classrooms of Korea. These are not boring lecturing videos. These videos show you what to do in the classroom. I know from experience that it is way easier to learn how to teach by watching other teachers do it vs. just reading about it. So if you are planning on teaching in Korea or elsewhere in Asia I think you might find these courses to be especially helpful. The basic course doesn't include feedback. It's an automated course. The advanced course does. 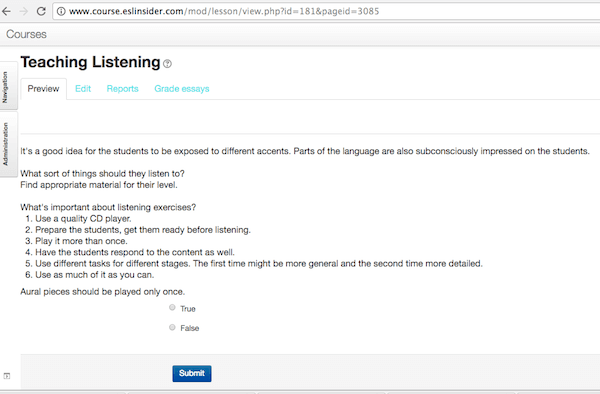 The advanced course includes 4 lesson planning assignments that include feedback. Feedback adds the human element which is often missing in online courses and helps you form a better lesson. Without it how will you know if your lessons are any good? It will tell you what you are doing right and what you are doing wrong and also give you some new ideas that you probably didn't think about. Are you thinking of teaching English in Asia? If so you will find a section in the beginning of the course devoted towards doing that. You can read some reviews or learn more about the courses.